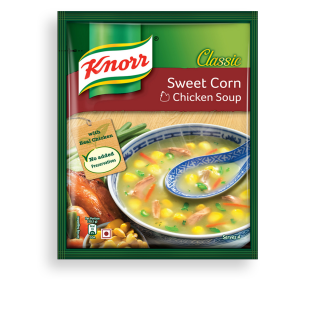 Knorr has hand-picked the best quality vegetables and mixed it with spices to make delicious Knorr Sweet Corn Chicken Soup. A perfect blend of corn, carrots, cabbage and chinese flavors with real chicken gives it its lip-smacking taste and perfect consistency and is a perfect way to get your children to eat vegetables and chicken. What's in our Sweet Corn Chicken Soup?